When I saw a post on scoop.it SL Destinations reporting that Serene Footman and Jade Koltai had just opened a new sim called Rummu I had to read about it and of course I had to visit it. 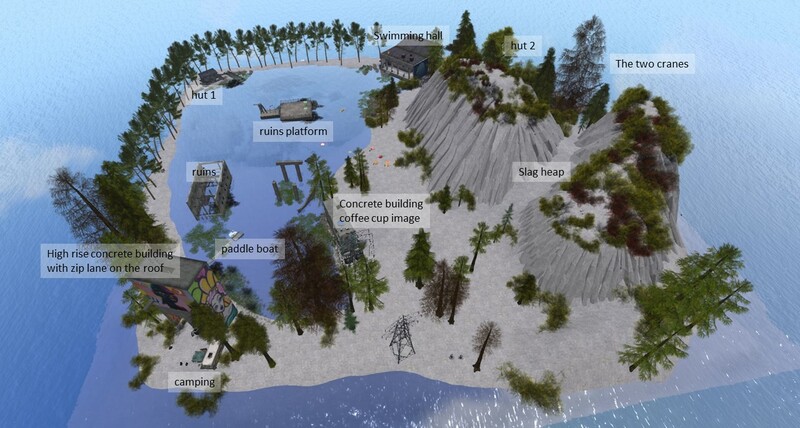 Serene has written a very detailed documentation about Rummu, Estonia, the place they rebuilt in SL. I strongly recommend to read this documentation and to watch the documantaries embedded there. It provides the needed information to judge what you see in Second Life. It also makes your visit in Second Life getting closer to the feeling that you know this place as if you were there. So what is Rummu? First of all it is a small borough in northern Estonia. Secondly there’s the Rummu quarry, a submerged limestone and Vasalemma marble quarry. “The latter is a specific kind of limestone with its structure and texture resembling that of marble. The quarry is close to two former prisons, the nearest being the former Rummu prison. During the Soviet era, until the 1990s, excavation was performed as hard labour prisoners. When pumping of water ceased, the quarry quickly filled with groundwater, forming a lake, immersing some of the utility buildings and machinery. Next to the lake is the Vasalemma spoil tip (slag heap). Over time, the spoil tip assumed a unique appearance through erosion by water. With the closure of the Rummu quarry, the area became a featured location for nature photography, hiking, rafting, scuba diving, as a summer spot, musical and sports events, and as a filming location for its unique layout. The site was depicted in the post-apocalyptic short film The Most Beautiful Day (2015) by Einar Kuusk. Several of the deserted buildings at Rummu were featured in the video for hit song “Faded” (2015) by Norwegian DJ Alan Walker. The area is closed now officially, which doesn’t prevent people from visiting. 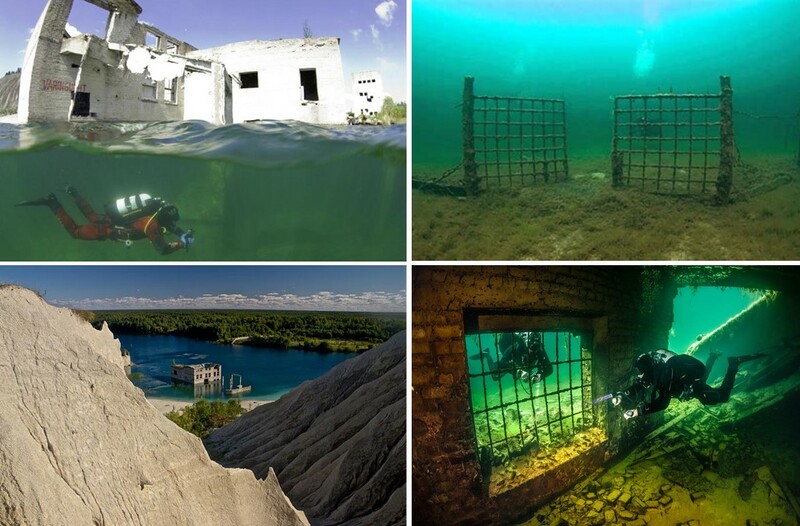 “Those who visit Rummu and write about the experience invariably say that besides the strange beauty of the derelict buildings that lie partially submerged, it is the knowledge of what lies below the water – and the terrible history of the prison itself – that lends the place its extraordinary charisma. We have tried to recreate this combination of surface and depth. If you venture into the water and walk around, you will soon find yourself in darkness, surrounded by plants and pieces of derelict building. Keep on going down the slope, and in the depths you will reach some gates. Here you enter the prison itself, deep under the water, just as divers do today. It’s a creepy place, for sure. Enough foreword and quotes – let’s get to Rummu in SL. Rummu is a moderate homestead. 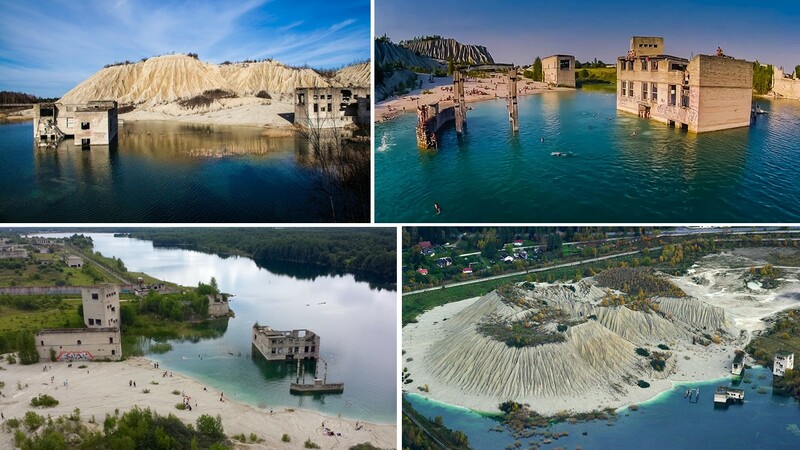 It is dominated by the lake with the rests of the prison and the quarry underwater, some concrete ruins of the former buildings still reaching high out of the water. There’s the slag heap, two big hills right next to the lake. Plants are growing on the slag heap. The lake is surrounded by beaches and some other solitaire concrete hugs buildings. The nature has taken back almost everything, plants and trees are growing out of every crack of the ruins. Some of the walls are covered artfully with murals outside and inside of the buildings. You can walk inside of the buildings and climb up to the roos for the view and for the fun there’s a zip lane leading from one of the buildings to a ruin in the center of the lake. Serene has added reams of chairs, benches, loungers, beach furntiure, camping furniture and during my visit some of them were taken by other visitors. You can also use a Swan paddle boat, the one I saw when visiting :notos:deer: (read Simploring 2018 (106) :nostos:deer:). I explored the whole sim, I visited the hut as well as the two cranes behind the slag heap. I dived and looked at the sunken prison, I went into all buildings, and i visited the ruins of a huge indoor swimming hall. I think, I won’t forget the statue there “A woman is more dangerous than a loaded pistol”, although I have no idea if it is something that belongs to the real Rummu (I think it doesn’t) nor do I know if it is build after a statue in RL. Rummu for sure has it’s magic attraction. Having the pictures in mind that I saw in the documentaries on Serene’s website made my visit quite real. It’s great to see how people take over these really scary places and turn it into something to enjoy. That doesn’t make us forget the history but gives hope that terror and violence won’t ever be permanent. Thank you Serene Footman and Jade Koltai for providing this once again impressive place to the public. I did really enjoy my visit!